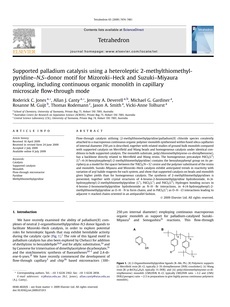 Flow-through catalysis utilising (2-methylthiomethylpyridine)palladium(II) chloride species covalently attached to a macroporous continuous organic polymer monolith synthesised within fused silica capillaries of internal diameter 250 mm is described, together with related studies of ground bulk monolith compared with supported catalysis on Merrifield and Wang beads and homogeneous catalysis under identical conditions to bulk supported catalysis. The monolith substrate, poly(chloromethylstyrene-co-divinylbenzene), has a backbone directly related to Merrifield and Wang resins. The homogeneous precatalyst PdCl2(L2) (L2¼4-(4-benzyloxyphenyl)-2-methylthiomethylpyridine) contains the benzyloxyphenyl group on its periphery as a model for the spacer between the ‘PdCl2(NwS)’ centre and the polymer substituent of the resins and monolith. Suzuki–Miyaura and Mizoroki–Heck catalysis exhibit anticipated trends in reactivity with variation of aryl halide reagents for each system, and show that supported catalysis on beads and monolith gives higher yields than for homogeneous catalysis. The synthesis of 2-methylthiomethylpyridines is presented, together with crystal structures of 4-bromo-2-bromomethylpyridine hydrobromide, 4-(4- hydroxyphenyl)-2-methylthiomethylpyridine (L1), PdCl2(L1) and PdCl2(L2). Hydrogen bonding occurs in 4-bromo-2-bromomethylpyridine hydrobromide as N–H/Br interactions, in 4-(4-hydroxyphenyl)-2- methylthiomethylpyridine as O–H/N to form chains, and in PdCl2(L1) as O–H/Cl interactions leading to adjacent p-stacked chains oriented in an antiparallel fashion.